In spring in Kyoto at Mount Kurama, a mountain priest overhears a party bless the cherry blossoms and he goes out to see the flowers. When the monks of Kurama Temple with children enjoy the party of cherry blossoms, they notice that a mountain priest stays and shares the time with them. The monks who despise to be with the mountain priest who seems out of place, leave the site. Only one child is left. When the mountain priest laments the unexpectedly small minds of the monks, the child who alone stayed behind the others comes to kindly talk to him. The mountain priest is attracted by this delicate boy and assumes that this boy must be Shanaō (Ushiwakamaru), the orphaned son of Minamoto no Yoshitomo. The child tells the mountain priest how he is always neglected while the other children are cherished because they are from the flourishing Heike clan while he belongs to the Genji. Sympathizing with Ushiwakamaru, the mountain priest gives him a view of the beautiful places for enjoying cherry blossoms in and near the Kyoto area and comforts the boy. Then, the mountain priest reveals that he is the Great Tengu (long-nosed goblin) of Mount Kurama, recommends Ushiwakamaru to destroy the Heike as he will train him in the art of warfare, and disappears with a promise to meet the boy again. Ushiwakamaru, who devotes himself to training under the Great Tengu, holds back to practice with small long-nosed goblins as he has not received his teacher’s permission. At that moment, the Great Tengu appears in a grand manner. The Tengu praises the deferential attitude of Ushiwakamaru and tells him the ancient story of Zhang Liang of the Han Dynasty, who was taught the secret art of war by sincerely serving his mentor. He then teaches every secret of the art of war and bids farewell to Ushiwakamaru. To Ushiwakamaru, who is throwing himself and grabbing Tengu’s sleeve, the Great Tengu promises that he will surely support Ushiwakamaru at the battle against the Heike clan in the future. He flies away above Mount Kurama in the evening. This piece is based on the story of Miyamoto no Yoshitsune in childhood. 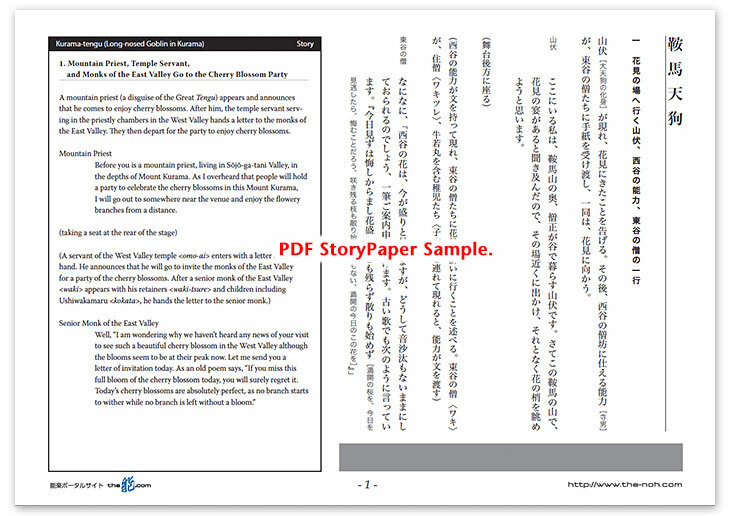 With the background of flowering Mount Kurama, the story develops various tasteful scenes, centered on the master-apprentice bond between dignified Great Tengu (long-nosed goblin) and lovely Ushiwakamaru. The first half of the drama is filled with interesting scenes: the appearance of many lovely children, the dance of a temple servant, and the snobbish comments of a senior monk. Then, the piece describes the spiritual exchange between the uncouth mountain priest, who is the disguise of the Great Tengu, and lonely Ushiwakamaru. The scene projects the colorful and poetic atmosphere of a deep mountain. The scene in the second half focuses on the commendable endeavor of Ushiwakamaru, who learns the art of war from the Tengu. Ushiwakamaru is described as a gallant, amiable boy, who admires his master, and the Great Tengu is described as a dignified figure who can be the chief of long-nosed goblins. 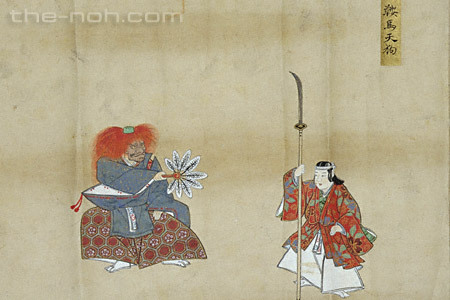 Although it is not very long, Kurama-Tengu is an entertaining piece filled with highlights with many characters and checkered chanting and movements.